Commemorative Albania stamps first appeared in 1924. There were a lot of important events going on in Albania, leading up to the proclamation of the republic in 1924, but there was little time to design and produce new commemorative or pictorial definitive stamps at the time. As a result, most of the commemorative and pictorial definitive stamp issues of 1924 consist of various overprints on the pictorial definitive stamps of 1922. 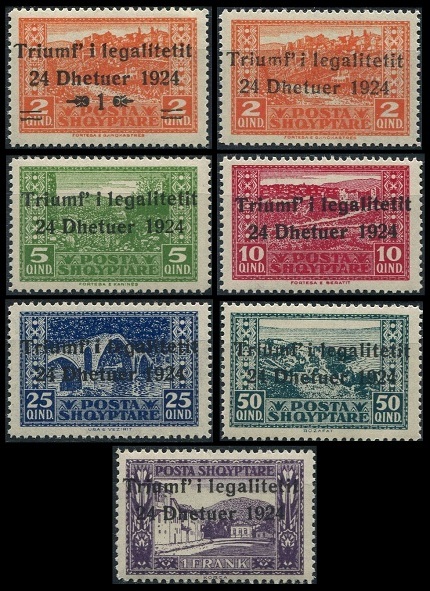 The five overprinted pictorial definitive stamps of 1922 shown above (Sc. #158-162) were issued in January 1924 to celebrate the Opening of the Constitutional Assembly. The overprint at the top of each stamp is "Mbledhje Kushtetuese" or "Constitutional Assembly". 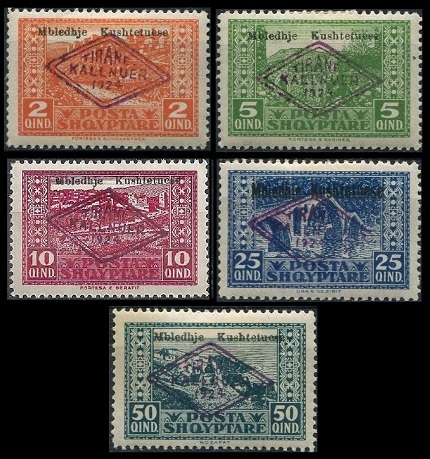 The diamond-shaped overprint on each stamp is "TIRANE / KALLNUER / 1924" or "Tirane / January / 1924". The new constitutional assembly formally dissolved the (now, permanently exiled) Albanian monarchy. The new constitution provided for the creation of a parliamentary republic, with a powerful president, who would serve a seven-year term as the head-of-state and government. 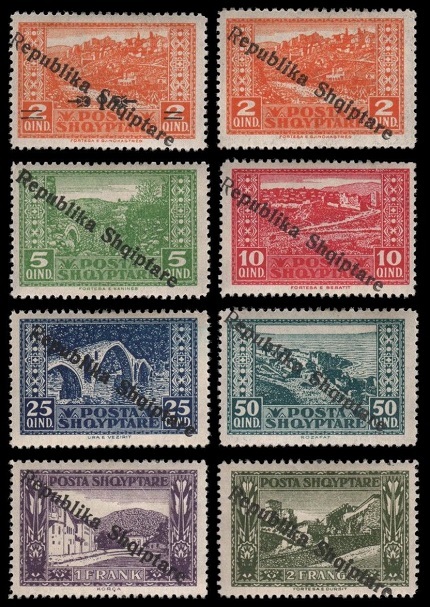 The seven overprinted pictorial definitive stamps of 1922 shown above (Sc. 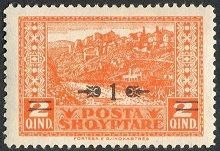 #164-170) were issued in December 1924 to celebrate the Return of the Government to Tirane, following the June Revolution. The overprint at the top of each stamp is "Triumf i legalitetit / 24 Dheuter 1924" or "Triumph of legality / 24 December 1924". In the June Revolution, a peasant-backed insurgency took control of Tirane, and their leader, Fan Noli (1882-1965), became the Regent and Prime Minister of Albania. The legitimate Prime Minister, Ahmet Zogu (1895-1961), fled to Yugoslavia. By Christmas Eve of 1924, Ahmet Zogu's forces had re-taken Tirane, re-establishing the legitimately elected government of the new republic. Fan Noli and his followers fled to Italy. The seven overprinted pictorial definitive stamps of 1922 shown above (Sc. #171-177) were issued on April 11, 1925 to celebrate the Proclamation of the Republic by the National Assembly on January 21, 1925 . The overprint at the top of each stamp is "Republika Shqiptare / 21 Kalinduer 1925" or "Republic of Albania / 21 January 1925". On January 31, 1925, Ahmet Zogu (1895-1961) was elected by the National Assembly, as the first President of the Republic of Albania. 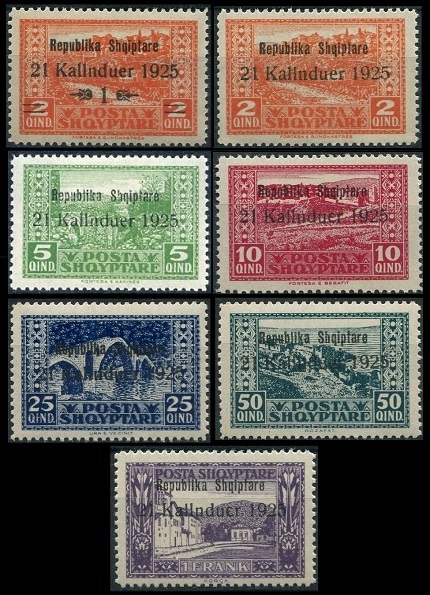 The eight diagonally overprinted pictorial definitive stamps of 1922 shown above (Sc. #178-185) were issued during 1925 to display the new name of the nation on the stamps as "Republika Shqiptare". During this period, 2 Q. denomination pictorial definitive stamps were re-valued to 1 Q. for use as Newspaper Stamps. The non-overprinted example shown above is Sc. #163. The four overprinted and surtaxed Albania charity stamps shown above (Sc. #B1-B4) were issued on November 21, 1924. The surtax was for the Albanian Red Cross. The four overprinted and double-surtaxed Albania charity stamps shown above (Sc. #B5-B8) were also issued in late 1924. The double-surtax was also for the Albanian Red Cross.